For many, 3D printing with plastic filament is not enough to take the 3D printing industry to the next production level. The other materials such as metal are very expensive and hard to apply in the production stage. The Mini Metal Maker 3D printer is a new Indiegogo campaign aims to fulfill this gap through producing an affordable 3D printer that enables users to create metal products. 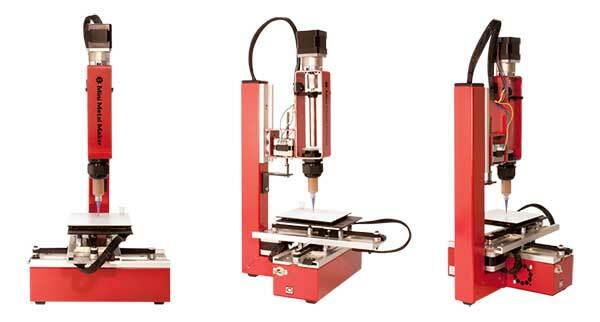 The new 3D printer is small size, cheap and high capabilities comparing with the printers used print metal materials in high temperature. The Mini Metal Maker is created by David Hartkop in Colorado, USA. The 3D printer uses the same FDM technology that is used in plastic filament printing. 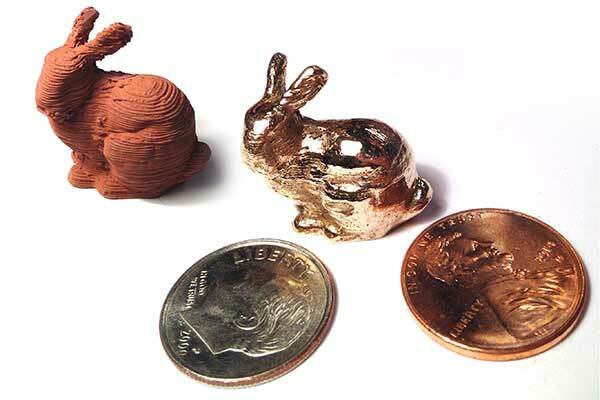 The 3D printer nozzle prints using a special mix between metal and clay called “Precious Metal Clays”. The materials is emulsion of metal particles in water solube organic binder. The metal clay is extruded very similar to ceramics. The mixture is set to be liquid enough to stick together when drying. Once the clay model is printed, it should be heated at 600 – 900 degree Celsius in a kiln. This heating degree removes the organic binders and leaves the metal particles fuse together. 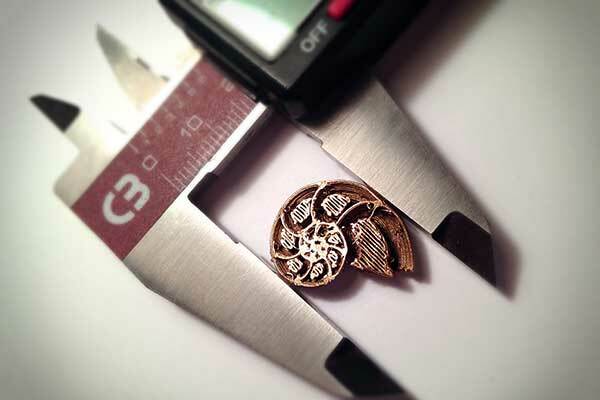 The technique can be used to print many metals such as bronze and copper. The final result has a shrink factor of around 12-20%. This range depends on many factors including the type of clay and firing procedure. So, the final metal model is smaller than the 3D printed clay as shown in the 3D printed examples. The new innovative technology merges between the filament nozzle printing and and clay printing to result an accurate and professional metal printing output. While this cannot be considered a full direct 3D metal printing, it can overcome many of the obstacles that prevent users from using metal materials such as the price and affordability. The 3D printer requires connection to the computer through USB, the team is developing a upgrade that can support SD card in the next versions. The Mini Metal Maker is collaborating with Metal adventures to produce metal clay 50g cartridges to be used with different types of extruder nozzles. You can also get the metal clay from Mini Metal Maker website. The Indiegogo campaign for the new 3D printer target jewelry designers, DIY makers and product designers. 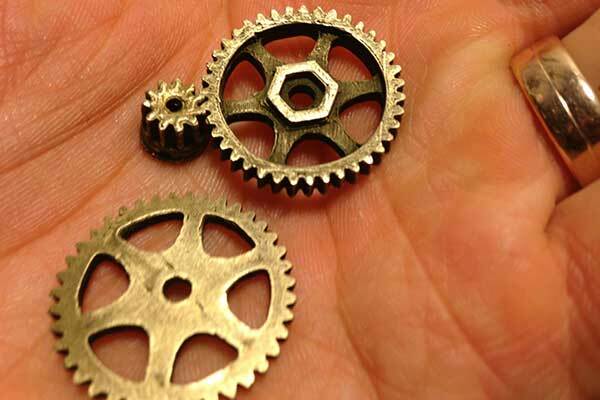 It can be used to create metal parts such as gears and clips, which gives it an advantage over the ordinary plastic FDM 3D printers. Merging between the extrusion 3D printing and metal printing through the Metal Clay opens the doors for more implementations for the 3D printing industry especially with the cheap printing price and high quality results.